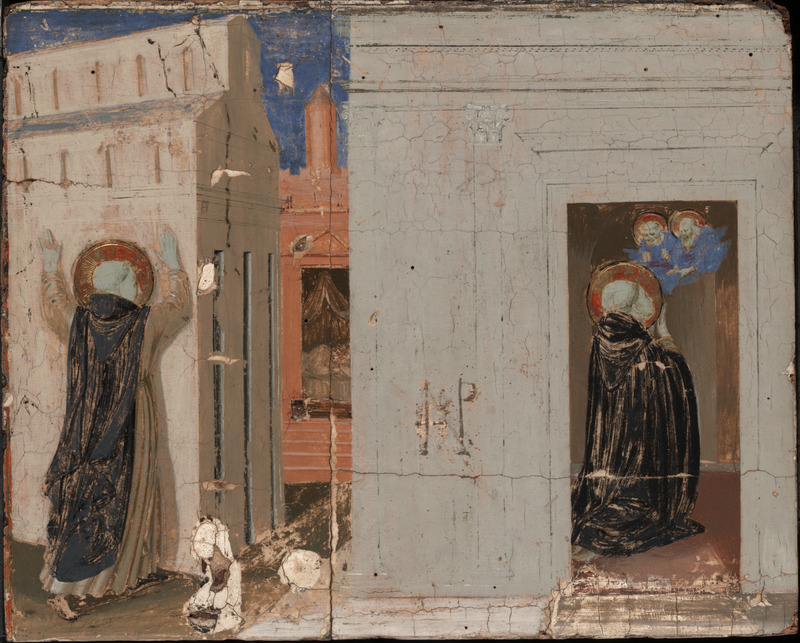 These three panels, previously not associated with each other, may be supposed to have formed part of a single predella dedicated to episodes from the life of Saint Dominic. All three are approximately the same height; they are closely related to each other stylistically; and all are preserved in a comparably damaged state. 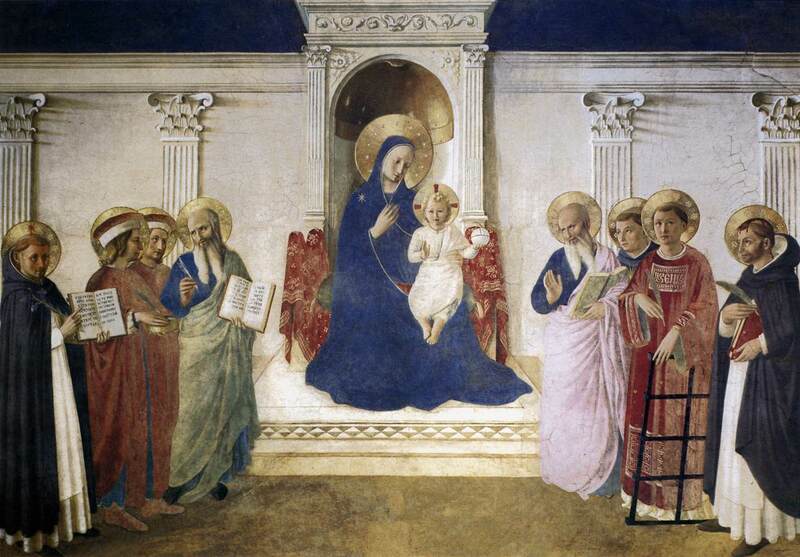 Primarily on account of their compromised condition, each of them has been relegated at one time or another to the status of an imitative or studio work, but each is demonstrably an autograph painting of exceptional quality and invention from the period of Fra Angelico's full maturity, following the completion of the San Marco high altarpiece. The Yale panel (A), the first in narrative sequence, compresses two episodes from the early ministry of Saint Dominic into a relatively constricted pictorial space. Художественная Галерея Йельского Университета, Нью Хавен. Pope Innocent III was initially reluctant to grant Dominic's petition for approval of a rule for a new order of Preachers. One night, dreaming of the ruin of the Lateran basilica, the pope had a vision of Dominic supporting the crumbling church on his shoulder and was immediately persuaded to embrace the new movement. In the event, Dominic and his followers chose to adopt the rule of Saint Augustine, but Innocent III died before their petition could be granted and his successor, Pope Honorius III, eventually approved the rule. Praying afterward in Saint Peter's basilica in Rome, Dominic had a vision of Saints Peter and Paul presenting him with a staff and a book, and instructing him to go forth and preach - a symbolic commission to his order to teach and perform missionary work. In the center of the Yale panel, in the middle distance, Pope Innocent III is visible through a doorway, asleep and dreaming, his vision of Saint Dominic unfolding before him at the left. Dominic, whose black cloak is thrown back over his shoulders to free his arms for his work, braces the crumbling walls of a church, which is rendered in steep foreshortening.The incisive shadow cast by Saint Dominic, the crisp highlights on the moldings and doorframes, and the realistic fissures in the masonry are all affectations characteristic of Fra Angelico's style in this period.The same precise rendering is carried over to the architectural details on the classicizing fa?ade of the building at the right, through the doorway of which Saint Dominic can be seen receiving his vision of Saints Peter and Paul. Although their legibility has been blunted by abrasion, the inventive sophistication of these details, including the elegantly undercut cornice of the doorframe, the exuberant acanthus decoration of the pilaster capitals, and the (now) barely visible niche-like chapel where the vision is enacted are paralleled elsewhere in Fra Angelico's oeuvre only on a monumental scale, in the fresco of the enthroned Madonna (fig. 127) on the east wall of the upper corridor at San Marco or in those in the Cappella Niccolina at the Vatican. The narrative sequence of the Cortona predella also begins at the left with The Dream of Pope Innocent III, but that scene and The Vision of Saints Peter and Paul are separated there by a vignette of Saint Dominic meeting Saint Francis, which is omitted from the Yale panel. 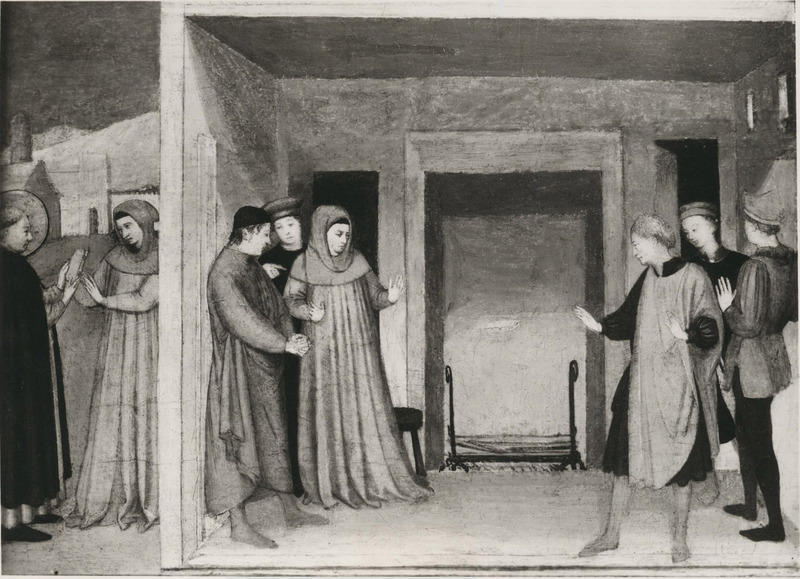 Its soberly organized scene was centered about a fireplace in the house of the heretics of Montpellier, six of whom recoil in astonishment as a book of Saint Dominic's sermons miraculously floats above a fire and is not burned. Once again, the image is conceived as a simplification and clarification of the much busier, more crowded episode portrayed in the Louvre predella, with a deeper and more measured sense of pictorial space and with less agitated but more dramatic gesturing figures. 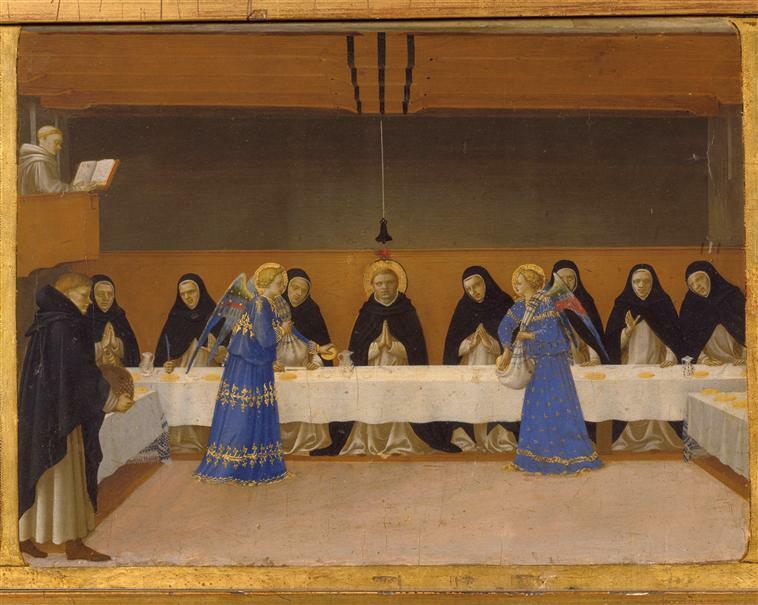 Following the Miracle of the Book in both the Louvre and Cortona predellas is a scene of Saint Dominic and his companions being fed by angels, the subject of the Stuttgart panel exhibited here (C). This scene, the most extensively damaged of the present series insofar as the losses encompass the complete lower quarter of the composition, is in many ways the most sophisticated in its narrative details. It transpired one day, in the convent church of San SistoVecchio in Rome, that not enough bread was available to feed the forty friars of the community. Dominic enjoined the brothers to divide equally what little bread there was among themselves, but as they prepared to dine on these tiny morsels, two angels miraculously appeared with aprons full of bread, which they spread before Dominic. In the Stuttgart panel, a refectory table is set against the back wall of a simple box-like room with two doors and six carefully rendered windows high up in the lateral walls. Along the rear wall and turning the corners onto the lateral walls is a plain wooden spalliera with a remarkably delicate cornice molding, and above this, suspended from three nails near the ceiling, is a black cloth standard with an image of the Crucifixion. A lay brother entering through the doorway at the left turns an empty basket upside down to show how little bread there was in the convent's pantry, while two angels place bulging cloth sacks on the table at either side of Saint Dominic, who is seated at its center. The spare setting of the miracle contrasts dramatically with that of the same scene in the Louvre predella (fig. 130), where the recession of the realistic wood rafters of the ceiling, the texture and folds of the embroidered linen tablecloths, and a pulpit and lectern (with a novice reading from the Scriptures) are painstakingly represented. The architectural backdrop of the Stuttgart panel is made more subtle by simplification, and the human drama of the event portrayed is greatly heightened - an indication of the painting's significantly later date. In both these respects the composition of the Stuttgart panel is far more satisfactory than that of the Cortona predella, where the scene is implausibly set out of doors and the figures resemble inexpressive mannequins. Echoing the example of the Paris and Cortona predellas, the narrative of Saint Dominic's life could have been completed either with a scene of the Raising of Napoleone Orsini (situated to the right of the Yale panel), or with a scene of the Death of Saint Dominic (following the Stuttgart panel), although no other versions of these subjects by Fra Angelico are known. (*3) It is also likely that, just as the Louvre predella contains an image of the Pieta at the center, the present predella might also have included a Passion scene at its center - specifically, the panel (B) depicting the Crucifixion and various saints, in The Metropolitan Museum ofArt, New York. Музей Исскуств Метрополитен, Нью Йорк. This painting, which was transferred to canvas and then back again to a panel support, is undoubtedly the best known and most controversial of the series. The original, although now-much-repaired gold background was overpainted at an early date with a naturalistic sky and two large palm trees, "shadows" of which are still visible impressed in the gesso and bole of the ground. It is possible that they were added to cover voids created by the removal of two angels that once hovered alongside the cross, as well as to repair or modernize the gold ground. The removal of the overpainted landscape elements by conservators at The Metropolitan Museum of Art in 1951 significantly altered the appearance of the panel, and while this perhaps eliminated a degree of uncertainty in previous discussions of its attribution, it also revealed the extremely abraded state of all but the two figures at the left of the scene, presumed to be Saints Augustine and Monica, representing the adoption of the Augustinian rule by the Dominican order. The two Dominican saints kneeling at the foot of the cross are universally identified as Dominic and Thomas Aquinas, whereas the figure on the left is unequivocally Saint Peter Martyr, the wound in his skull clearly visible on close inspection. Although the figure at the far right is usually described as Saint Elizabeth of Hungary, patroness of the third order of Saint Francis, she does not wear a Clarissan habit, and she could equally be meant to portray Saint Dorothy or Saint Cecilia. The precise identification of the figures in the Metropolitan Museum Christ on the Cross is of some importance in that they may ultimately establish the probable origin of this predella. The combined width of the five known or presumed panels - approximately 240 centimeters(*4) - is equaled only by the predella to the San Marco high altarpiece (cat. 34), among all of Fra Angelico's production. Its iconography, coupled with its size, implies that the structure to which it belonged was likely to have been the principal altarpiece of a major Dominican church, and that Saint Dominic, who is conspicuously absent from the New York Crucifixion scene, was included in the main panel or elsewhere in the complex. 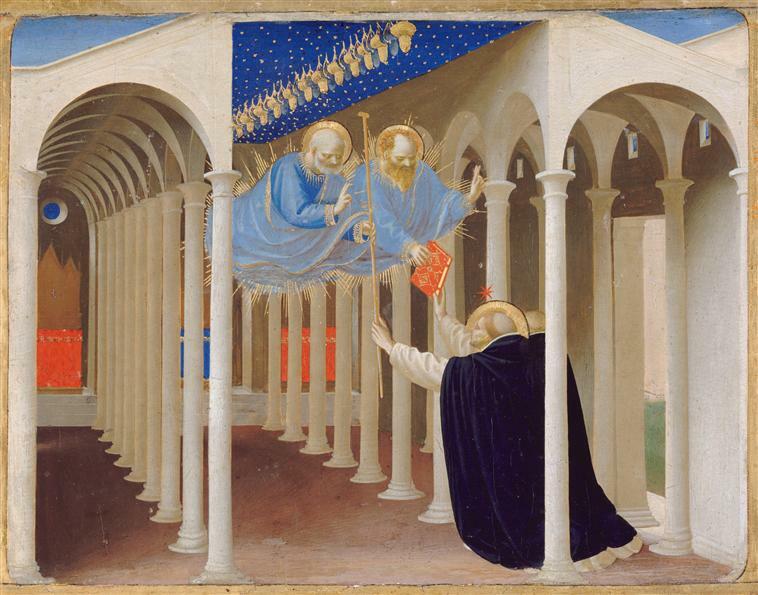 No altarpiece by Fra Angelico of this date, size, or description is known, however, which can be linked to this predella, and documents make no concrete allusions to any likely candidates that might now be lost. (*5) Vasari does claim that the high altarpiece in the Dominican church of Santa Maria sopra Minerva in Rome was painted by Angelico, and, if this were true (no independent confirmation of this claim in documents or in other early sources has been found), it would not be unreasonable to suggest that the present predella could be a surviving element of this undoubtedly major work. On the other hand, the inclusion of Saints Monica (?) - neither this figure nor the bishop alongside her wears a leather belt, which would establish their identity as Augustine and his mother - and Cecilia (or Dorothy) in the New York Christ on the Cross might suggest that the altarpiece was intended for a female house of the Dominican order, but no further deductions based on the evidence of the panels themselves seem possible at present. 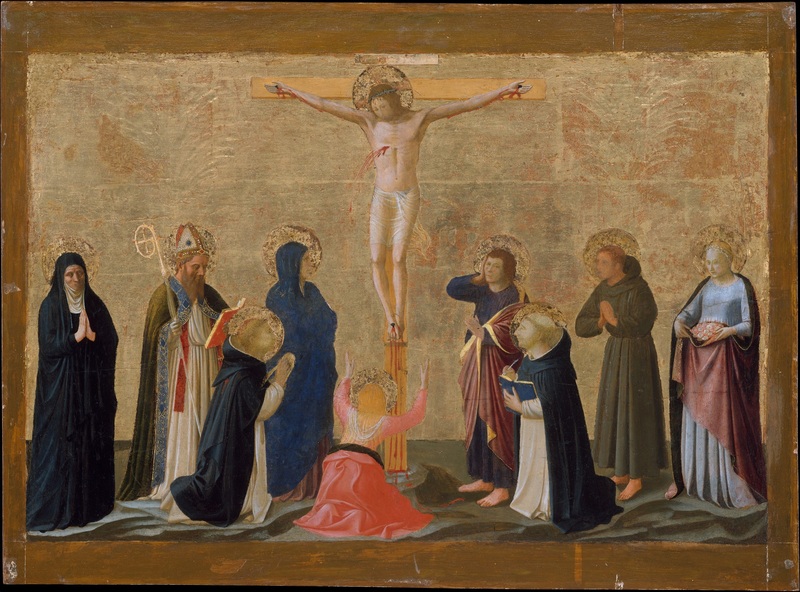 It has been proposed that the Metropolitan Museum Crucifixion might have been an independent devotional work rather than the center panel of a predella,(*6) and that it might be identical with a painting by Fra Angelico in the anticamera of Piero di Lorenzo de' Medici recorded in a 1492 inventory of the Palazzo Medici: "una tavoletta quadra dipintovi . . . uno Christo in croce con 9 figure d'attorno. "(*7) Despite the interesting coincidence of its subject, the high value placed on this painting - twelve florins - suggests that it describes a larger panel; Angelico's Thebaid (now in the Uffizi), which measures over two meters in length, appears in the same inventory with a valuation of fifteen florins. (*2).This panel was published by Berenson (1932 b, p. 524) as by Fra Angelico, about 1440. The dimensions of the panel are generally — and incorrectly — recorded as 24 x 33.5 centimeters; the correct dimensions are given by M. Davies (1961, p. 36). Further confusion was introduced by Pope-Hennessy, who catalogued the painting as having been exhibited by Lord Rothermere at the Burlington Fine Arts Club in 1919, as a work by Masolino; Lord Rothermere did own this painting, but he acquired it sometime after 1923 and sold it in 1941 (Christie's, London, December 19, 1941, lot 92, as a Miracle of Saint Mark by Masolino; 13 1/4 x 18 1/2 in.). The painting was purchased at the Rothermere sale by Agnew's, London, who, presumably, sold it to Sir Thomas Barlow. Previously — but not known on what authority — it is said to have belonged to John Bowyer Nichols (1779-1863), to R. C. Witt, and to the Honorable Robert Bruce. It was purchased by Colnaghi, London, on March 31, 1922, from Tancred Borenius (again as a Miracle of Saint Mark by Masolino, measuring 13 1/2 x 18 3/8 in. ), and sold by them to C. F. U. Meeks on October 1, 1923. 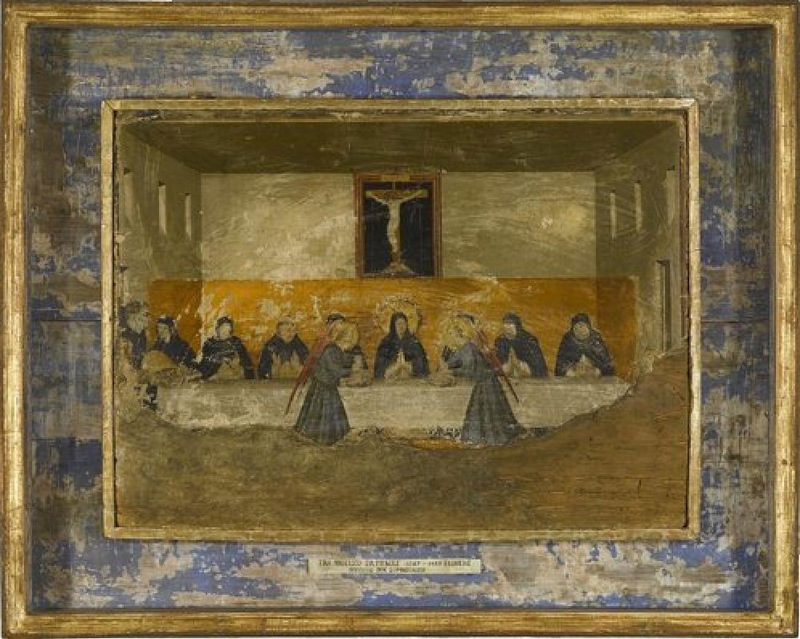 The panel was last exhibited in Birmingham from August to October 1955, in "Exhibition of Italian Art from the 13th Century to the 17th Century," no. 4; its present whereabouts are unknown. (*3). A fragmentary replica of the right third of the scene of the Raising of Napoleone Orsini as portrayed in the Cortona predella was exhibited in Stuttgart in 1950 ("Fruhe italienische Tafelmalerei," no. 80, as by the Master of the Griggs Crucifixion; 23.3 x 18.1 cm). It is impossible to judge from the illustration in the Stuttgart catalogue whether this panel might have been a fake or a heavily overpainted original fragment by Fra Angelico missing from the predella reconstructed here. (*4). The Yale panel preserves a narrow strip of black paint and gilding along its left margin but has been cropped within the picture field at the right. It is likely that approximately five centimeters are missing from this side, which would have centered the portico of Old Saint Peter's within its fa?ade and brought the panel into greater conformity with the width of the Stuttgart and ex-Barlow panels. A similar border of black paint and gilding is visible at the right of the Stuttgart panel, which might imply that this was the final scene of the predella. Photographs of the ex-Barlow panel mask its edges. (*5). W. Bombe (1912, p. 77) quotes a statement in the Annali of Padre Bottonio (Ms., Bibl. Cons., Perugia, ii, c. 72), ascribing "l'altra tavola posta in chiesa Vecchia [San Domenico, Perugia] sopra l'altar maggore" to "F Gio. da Fiesole padre nostro et famosissimo pittore de l'ordine nostro." S. Orlandi (1954 b, pp. 199-201) identifies this altarpiece, instead, with a lost painting commissioned from Fra Filippo Lippi in 1451. (*6). Zeri and Gardner 1971, pp. 78-79. (*7).Salmi 1958, p. 89; Muntz 1888, p. 86. It is tempting to identify this painting with the "Crocifisso con altre figurine, di fra Giovanni da Fiesole domenicano," listed in a seventeenth-century inventory (undated, but after 1658) of the Guicciardini collection in Florence (Fallani 1992, p. 188), which includes several other paintings formerly in the Palazzo Medici (see p. 283 n. 8). What appears to be the same painting is described in an earlier (1643) Guicciardini inventory as "un quadretto entrovi un Crocifisso con piu figure, alto br. 1 1/8 et largho br. 1.1.8, tutto col fondo d'oro" (ibid., p. 182).